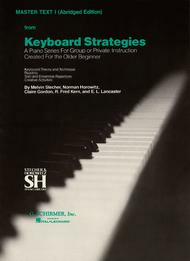 Piano Technique. Composed by Various. Edited by Melvin Stecher and Norman Horowitz. Piano Collection. Instruction, Classical. 216 pages. G. Schirmer #SH19110. Published by G. Schirmer (HL.50500130). Chapters I-VII are printed in their entirety – particularly useful to the class who wishes to perform more repertoire within each chapter, or to explore the concepts and creative activities at a more leisurely pace.